Teahouse Feeders are made from redwood and have a removable perch on the bottom for easy cleaning. All the etchings are original designs by Gary Schrodt . Perches are spaced to discourage larger birds like bluejays. 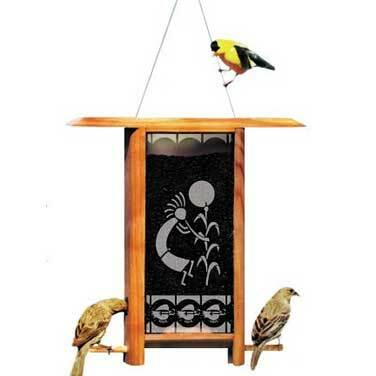 This medium-sized Teahouse birdfeeder has two feeding ports.